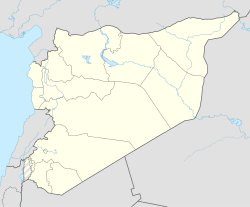 Tell Shamiram or Tell Shamiran (Arabic: تل شميرام أو تل شميران‎), also known as Marbisho (ماربيشو), is a village near Tell Tamer in western al-Hasakah Governorate, northeastern Syria. Administratively it belongs to the Nahiya Tell Tamer. The village is inhabited by Assyrians belonging to the Assyrian Church of the East, and Arabs. At the 2004 census, it had a population of 811. It is located on the Harbur River near the confluence with the Zirgan River, about 70 kilometres (43 mi) south of the border with Turkey. The village was settled by Assyrian refugees in 1933 who moved following the Simele massacre to French controlled Syria to settle in a 25 kilometres (16 mi) stretch of the Khabur River in 35 settlements. In February 2015 the village was taken by the Islamic State militia during the Al-Hasakah offensive (February–March 2015), resulting in the abduction of about 90, mainly elderly, residents. Several thousand residents fled the city, mostly to the city of al-Hasakah, with some eventually reaching Lebanon. Unconfirmed reports indicate that the village has been emptied of people by 1 March 2015. ^ a b "2004 Census Data for Nahiya Tell Tamer" (in Arabic). Syrian Central Bureau of Statistics. Retrieved 15 October 2015. Also available in English: UN OCHA. "2004 Census Data". Humanitarian Data Exchange. Retrieved 4 December 2015. ^ NOTES ON KHABOR ASSYRIANS. ^ Fernandez, Alberto M. (1998). "Dawn at Tell Tamer: The Assyrian Christian Survival on the Khabur River" (PDF). Journal of Assyrian Academic Studies. 12 (1): 34–47. ^ ISIS capture town of and Tal Hermiz the Villages of Tal Nasri, Tal Shamiran, Yalda, Qasr Toma, Tal Harmoz Aghabish following YPG withdrawal . ^ ACN Press Release: Syria Extremists IS – seize Christian towns. ^ Christians flee jihadists after Syria kidnappings 26 Feb 2015. ^ Syrian sources say ISIS executed 15 Christians – with more killing to come Archived 2015-09-23 at the Wayback Machine, February 26, 2015. ^ Johnlee Varghese March 1, 2015 Over 200 Abducted Assyrian Christians Being Tried by Isis Kangaroo Court. This Syria location article is a stub. You can help Wikipedia by expanding it. This page was last edited on 15 June 2018, at 20:53 (UTC).